Kiyoshi Nagata has been performing taiko in a career that spans three decades. His principal studies were with Daihachi Oguchi (as artistic director and performer of the Toronto-based, Suwa Daiko from 1982 to 1992) and with Kodo (as an apprentice from 1993 to 1994). 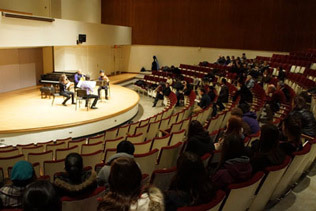 With the assistance of a Chalmers Performing Arts Training Grant in 1999, Kiyoshi studied classical percussion with Paul Houle at the Royal Conservatory of Music in Toronto. Kiyoshi has taught taiko at the U of T Faculty of Music since 1998. He also taught a public taiko course at the Royal Conservatory of Music from 2003 to 2011. Apart from leading his professional group, Nagata Shachu, Kiyoshi is regularly invited by universities and taiko groups to present workshops and lectures. He has composed and performed taiko music for dance, theatre, film and radio and continues to collaborate with artists from all genres of music including traditional Japanese instrumentalists.